When I started sewing again, one of the first things I decided to do was to get all my patterns and fabric organized. I only had a small stash: one box of quilting fabric, one box of apparel fabric, and one box with patterns and unfinished objects (UFOs). It had been a while since I had gone through it all and I honestly had no idea what I had to work with. The other reason for getting organized was that I was tired of going to the fabric store, finding the perfect fabric, and then having no idea how much to buy. Other times I would come home without buttons, or with the wrong type of zipper. I couldn’t carry around all my patterns, just in case I needed to consult the back of the pattern, or could I? My goal was to create a system that was easy to use, affordable, allowed me to know what I had in terms of fabric and consult my patterns anytime and anywhere. There are a couple of ways to do this. Of course you can do this the low-tech way, lugging patterns around, or little scraps of paper, but this wasn’t working for me. So I decided to go high-tech. There are a number of dedicated smartphone and/or desktop apps you can use. Sewing Kit HD is an application that is available for the iPad while Sewing Kit is built for iPhone. You can use it to keep track of your patterns, fabric, measurements and other data. It doesn’t allow you to sync between devices, however. Cost: $9 for iPad, $5 for iPhone. PatternPal for iPhone lets you organize your sewing projects. It keeps track of patterns and allows you to input up to 2 photos. There is also a Fabric Stash app for an additional fee. Total cost: $5. 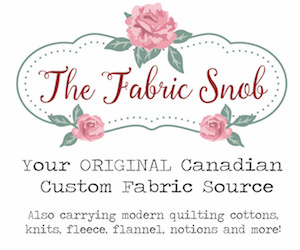 Add $4 if you also want Fabric Stash. PatternFile is a desktop application that lets you keep track of which patterns you own, and where they are located. It costs $10-20 USD, but if you want to be able to use your data on a mobile device (of course you do! ), and to automatically import pattern data, it’s another $5 per month. Mobile apps are available for iPhone, IPad and Android. The iPhone and iPad apps are only available in the US iTunes store. The software automatically imports pattern data, images, yardage, etc. directly from the pattern companies’ websites. It also allow you to quickly import data for some vintage patterns. This is a really great feature, especially if you use current patterns from the ‘Big Four’ commercial pattern companies. PatternFile also allows you to share you data with friends and see which patterns they have. I can safely say I would never use this feature. The chances of a friend using the exact same software, and having patterns I want to look at is exactly zero. Filemaker makes a product for Macs only called Bento that allows you to create simple databases. The system is pretty flexible, so you can decide what information you want to store. Fabric, patterns, and notions can all be recorded, you just need to take the time to set things up. There are even some ready-made templates available for organizing sewing patterns which can save you some time. Bento allows you to download their product for a 30-day trial. Unfortunately, I had downloaded Bento a few years ago for some now forgotten reason but hadn’t gotten around to testing it out, and once your time has run out, you can’t get another trial. There are also Bento apps for iPhone and iPad that allow you to sync your data and make it portable, but these are not free. Total cost: $49 for Mac, $5 for iPhone, $10 for iPad. Evernote isn’t really an application as much as a web service. It allows you to keep track of patterns, notions, fabric, and anything else you like. You aren’t limited to any number of photos and you can even save PDFs directly to the service. As long as you upload 60MB per month, or less, the service is free. Otherwise it’s $45 per year. If you are routinely entering the same type of data, you can even set up templates to save time. You can access your data through a web browser, using a Windows or Mac desktop application, or on your iPhone, iPad, Android, Blackberry or Windows Mobile phone. You can also share your data with friends, if you choose to (I have no need of this feature). Evernote was the winner. It is free, easy to use, and did all the things I wanted (except for magically importing pattern data). I started with my fabric. 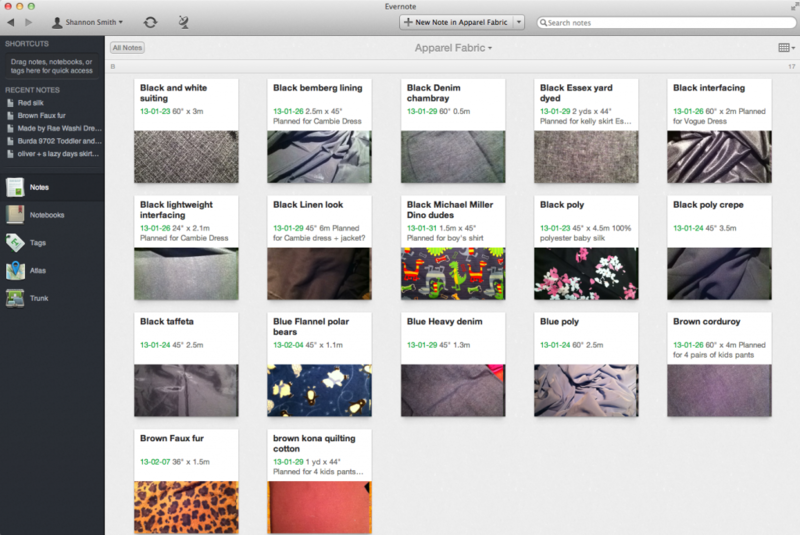 I created a ‘Notebook’ in Evernote called apparel fabric, then I started documenting all the fabric in my stash. For each piece I created a ‘note’. I took a quick and dirty photo of everything I had, and measured it and included that info. Evernote helps you keep the file size down by letting you take photos within the app in smaller file sizes. The whole process was pretty quick. I only had one big box of fabric and I documented it one night while watching bad tv shows. That is also why the photos are a bit ‘meh’. Evernote lets you sort alphabetically by the title of the note, so if you want to organize by colour, put the colour first in the note title, if you want to organize by fabric type, then put the words ‘lining’, or ‘silk’ first. 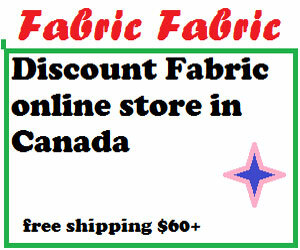 If you want to, you can note how much you paid, where you purchased your fabric, care details, etc. You can also attach tags to notes that help you find things later. I didn’t really use tags for my fabric collection. Some of my fabric stash. I’m pretty sure I will die an old woman and my grandchildren will have to deal with that jaguar-print fun fur. Next I tackled my patterns. I created three notebooks, one for women’s patterns, one for men’s and one for kids’. This was the best way for me to start, since there is no overlap in these categories, at least not within my pattern collection. Well, I suppose there is that 1980s bomber jacket, but the chances of me sewing that for someone of any gender is small. I used the pattern company name, followed by the pattern number in the title, and then the name of the pattern (i.e. Kelly Skirt). Then I pulled in the pattern front, pattern back and technical drawing for each one. In some cases there is also a link to the pattern company site, or to an inspiring blog post by someone who has made the same garment. I really like that this system is so flexible. I can keep track of digital patterns and printed ones, ‘Big Four’ patterns and independent ones, patterns for me and for others. I can even include all my vintage patterns. Some of my pattern collection in Evernote. I’m pretty sure I won’t be making that bustier from the 1980s. With my fabrics, I only used a few tags, but with my patterns I used a lot. I tagged my patterns with the pattern company, the decade, the type of garment (dress, top, etc.) and any distinguishing features that I might want to search for later (gored skirt, puff sleeves, asymmetric, vintage, summer, half-size, etc.). This process was more time consuming that recording my fabric, but well worth the effort. Now if I see a fabric that would make, say, a great summer dress, maybe with ruffles, I can just open up Evernote on my smart phone and search for ‘summer dress ruffle’ and see all the patterns I own that fit those criteria. Then I can choose one pattern, and get the yardage and notion requirements from the image of the pattern back. I have my entire database of patterns available at all times. I also like that I have a good idea of what patterns are ‘missing’ from my collection. I don’t own a good jeans pattern, for example, and the men I sew for have very slim pickings. I also can avoid duplicating pattern purchases. In a zombie apocalypse, I now know that I will be able to clothe girls between the ages of 3 and 12 in skirts that are a-line, tiered, gathered, pleated, or culottes, in all lengths, without ever leaving the house to purchase a pattern. How did this happen? Overall, I’m very happy with this solution. 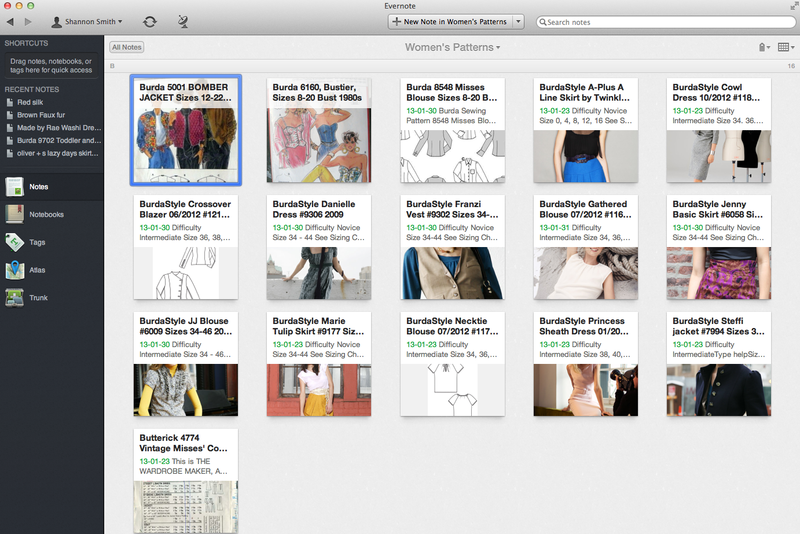 You can see how some other bloggers are using Evernote with their sewing here, here, here, here and here. Everyone is organizing their patterns a little bit differently, which just shows how flexible this solution is. What about you? How do you organize your patterns and fabric? 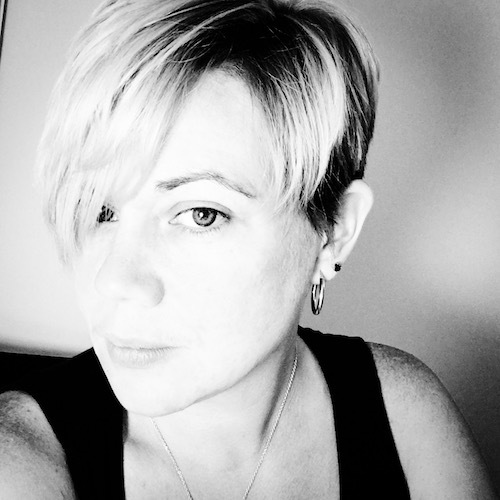 Note: This post contains an Evernote affiliate link. If you click on it, I get a little extra storage space, but no monetary compensation. As always, my opinions are my own.